I’m 48 years old, and when I grow up I want to be a teacher. Today’s episode 138 is a behind the scenes look at my journey to make a living as an online educator. I share my goals and the steps I am taking to create the life I want helping people figure things out. Today is a bit of a story time episode and sharing some recent realizations I have acknowledged. 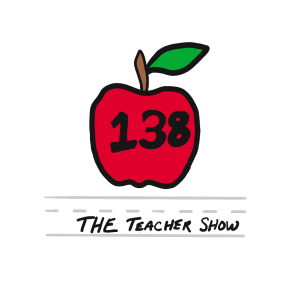 So shine those apples and let’s get into Episode 138: The Teacher Show. I’ll answer this question by taking a look back in history first. My Tagline: Learn. Create & Move Forward. For as long as I can remember I’ve been motivated by learning anything and everything that interests me. Some of my happiest memories were talking about books and playing cards and watching trivia game shows with my mom because I enjoyed the activity of feeding my curious mind. I didn’t really care with what… I just wanted knowledge and mostly simple stuff to make me go huh. I didn’t care much to learn about the pythagorean theory, but knowing that the Grand Canyon was 18 miles wide in places or that Santa Fe was the highest capital, now those types of things excited me. When I got to college I had no idea what I wanted to do (a common theme in my life), but the environment of being in a college town surrounded by old book stores and academia people everywhere was all I needed. Until now, I’ve always lived in college towns for that very same energy of being around people who like to think and be creative and just have a hunger for more. I traveled to learn and explore. My typical day on any trip I have ever taken is to wake up early, grab my camera and just walk and take photos and videos and soak up new sights and pick up tidbits here and there. Rinse and repeat. That inspires me. Learn. Create. Move Forward. 3 things that have been a constant in my life and imagine will be forever. I take tutorials as a student every single day. I create something every single. I do something every day to make this business better. I never stop. So what does a perfect world look like for Mike Murphy LLC? I want to make tutorials and be recognized as someone who knows their stuff because they work really hard at it and care. Getting paid to do what I love to do. Doesn’t everybody want that? Some people have it. Why can’t I? And why can’t you? What do I want to teach and who is my target audience? I am very conscious of relevancy. Trendy is not important to me, but recognizing trends and behaviors is something I do intuitively and I pay attention to everything that gets my attention. I want to teach others what I think will help them when they most likely do not realize it yet. I have a very good filter that completely ignores a lot of the noise online and I look for the nuggets that catch my eye and it usually in the form of something very unassuming and simple that gets me. The extra mile stuff. Attention to detail. Caring. I love the technology and creativity behind everything, but what really attracts me is when there is an underlying message of simplicity and good. I like products and tools that have the best intentions of others in mind and not just as a front or marketing tool. In terms of specifics, content creation in the new media is my zone. Video, podcasting, writing ebooks and articles about the latest and greatest. I want to reach the hard-working people who are giving it their all. My target audience is creatives and go-getters who are not afraid to get their hands dirty and try. Well… I made 365 videos in 2017 to get better at teaching and video. I’ve created daily content for over 900 days in a row to push my creativity and build confidence and reach people and many other benefits. I’ve never missed a day on Instagram Stories to improve my storytelling skills and to share my thoughts and ideas and to maybe inspire people by sharing what I’m working on and what is putting me to the test. I’m relentless and selfish as I am doing everything in my power to be a great creator and educator. I make daily tutorials and hope they help someone, but the only thing I expect in return is that the next day I make a better one. So what am I doing to position myself as an online educator? I’m setting the bar really high for myself and while I really do not care to compete with anyone but myself, I am very conscious that I am putting in the extra effort that most are unwilling to do and the position I am going for is way ahead of the pack. I wrote today’s podcast because for the first time in 48 years I identified with the title of a profession or career that I feel like I have been seeking for my entire life. I am a teacher. I enjoy making tutorials. I like the challenge of taking a topic that most people would need ten minutes to teach and I try to do in 60 seconds. Another step I am taking to position myself as an online educator that may not seem so obvious is Murphy Concierge, my local tech handyman business. I get paid to help people figure things out. Sounds a lot like what a teacher does, doesn’t it? I am teaching people in person and when I mix that with creating digital work, I see it as a super-power. I started Murphy Concierge on one account because I really need to make an income, but I modeled it around everything I am trying to do online and that is learn, create and move forward. My local handyman business is feeding me content that I can teach online and it’s also helping me figure out business and productivity and marketing. It’s a win-win cycle for me and you as the better I get and more knowledgeable I become the better the content I create and can share to others. Today was a reminder that at some point you need to pick your head up and do a self-audit or tell the universe out loud what you really want. Be honest. Do you know where you would like to be going? Today was about seeing the trees through the forest and making the effort. When I started making stuff online I had zero idea what I was doing, so I decided to just make stuff. I watched a Ted Talk that I will never forget that just said, keep making things if you do not know what do to and you will start removing the things you don’t want to do and get really good at a few things. And then you either figure it out or someone smarter than you recognizes your talents and opens up a door you never knew existed. About 2 weeks ago I officially acknowledged this to myself that I really just want to teach people simple things (for me) like the quick tip tutorials I make. That makes me really happy, but that can’t possibly pay the bills can it? I have studied and practiced Adobe Photoshop and all of the other products in the Creative Cloud for 10+ years and I want to position myself as an expert because I am. 2 years ago I said on this podcast that teaching for Lynda or Adobe was a secret goal I had but there was not one part of me that really believed I was good enough or at that level to teach for Lynda or to collaborate with Adobe. That has changed and part of the inspiration for today. It changed when I said, wait a minute, I am an online educator right now. I am qualified to teach for Lynda (now LinkedIn) or Adobe and I’d still really like to. I want to teach at a high level. I said it out loud. It’s subtle and simple because nothing has changed except my own self-awareness and perception of what I do and what I want to do. Own it. So what does the future hold for Mike Murphy LLC and what does a perfect world look like for my business? I want to learn, create and move forward teaching and inspiring others along the way. Creative educators they say are going to be highly sought after as technology disrupts the status quo and I’m all in. Just saying it out loud. Nobody can read your mind. If you want it, let someone know. Even if you’re not sure if anyone is listening.